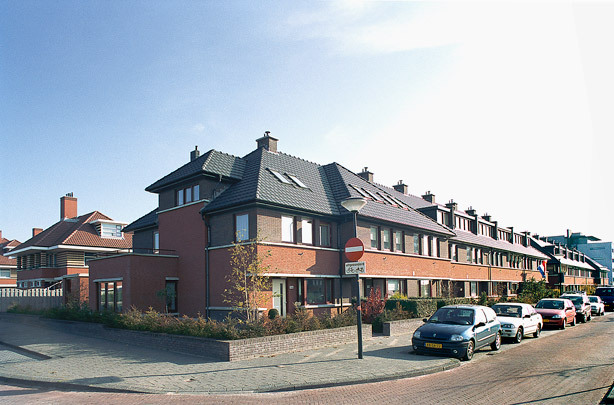 This Vinex district occupies an elongated site formerly given over to glass nursery houses on annexed ground in the municipality of Wateringen. Boasting some 8000 housing units, the district’s central axis is a broad avenue with its tramline and monumental buildings courtesy of Soeters Van Eldonk. The whole is intended as a ‘Hague garden city of the future’ with freestanding and semi-detached privately owned dwellings in a mock ‘Hague School’ style in the northern part and more modernist blocks of rented and owner-occupied units in the south. Each sub-plan has been given its own name, profile, image and ambience though The Hague resonates in all of them.